“State of the Art”, Mycotoxin Testing! A false negative result is just what you, or your doctor can’t afford when dealing with mycotoxin exposure. Before a patient can get well, you have to know what’s wrong first. Accurate mycotoxin testing at the highest levels of detection is critical for the right diagnosis the first time, and the medical decisions that will follow. More sensitive mycotoxin limits detection helps the physician target specific mycotoxins in the detoxification process. Since all mycotoxins do not behave the same chemically, it is of great importance to isolate the mycotoxin pathogens individually, and then target each mycotoxin specifically in the detoxification process. Better diagnostics lead to better treatment, knowing what you’re dealing with is half the battle. The following medical documentation concerning mycotoxins and disease are published by the Centers for Disease Control (CDC). Click the link to download the PDF. The guidelines and acceptable limits set forth by the United States FDA concerning food stuffs and feeds contaminated by fungus, does not address the “raw count” (number) of fungal spores in a structure, or on a food source, but instead addresses the levels of mold toxins, or amounts of poison / mycotoxin(s) present. The units of measurement used in the detection process for mycotoxins are calculated in, “Parts-Per-Billion” (ppb), or “Parts-Per-Trillion” (ppt). For a better understanding regarding the “toxicity” (potency) of these organic poisons and to put their toxicity into prospective, we have created the following analogies. One (1) ppb would be the equivalent in the measurement of time, of one (1) second, in a thirty two (32) year period. Or in numeric comparison, one (1) contaminated kernel of corn in ten thousand (10,000) bushel bins of corn. According to the Iowa Corn Grows Association, the average ear of corn has eight hundred (800) kernels. One hundred (100) bushel bins of corn will yield on average seven million two hundred eighty thousand (7,280,000) kernels of corn. In ten thousand (10,000) bushel bins of corn there would be an estimated seven hundred twenty eight million (728,000,000) kernels of corn, in which no more than twenty (20) ppb of Aflatoxin may be present to be considered not dangerous to human health, this could be as little as one kernel of contaminated corn. If the U.S. Food and Drug Administration” FDA”, currently tests milk for Aflatoxin, and if those results are at .54 ppb that milk is labeled “not fit for human consumption”. Commonly, patient laboratory specimens and their environmental tests results for Aflatoxin have produce positive results 10-20 times higher than the FDA’s allowable limit for milk contamination. Mycotoxins have the potential for both acute and chronic health effects via ingestion, skin contact, and inhalation. These toxins can enter the blood stream and lymphatic system; they inhibit protein synthesis, damage macrophage systems, inhibit particle clearance of the lung, and increase sensitivity to bacterial endotoxin and inflammation. 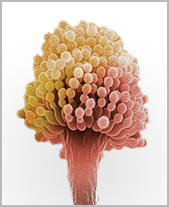 Aflatoxins are potent toxic, carcinogenic, mutagenic, immunosuppressive agents, produced as secondary metabolites by the fungus Aspergillus flavus and Aspergillus parasiticus on variety of food products. Among 18 different types of aflatoxins identified, major members are aflatoxin B1, B2, G1, and G2. Ochratoxin is primarily produced by species of Penicillium and Aspergillus. Ochratoxin is damaging to the kidneys and liver and is also considered by many a carcinogen. Ochratoxin A may cause vitamin deficiency, caloric deprivation; infectious disease status can all have compounded effects with mycotoxins. T-2 Toxin is a Trichothecene produced by species of Fusarium and is one of the more deadly toxins. If ingested in sufficient quantity, T-2 toxin can severely damage the entire digestive tract and cause rapid death due to internal hemorrhage. T-2 has been implicated in the human diseases alimentary toxic aleukia and pulmonary hemosiderosis. Damage caused by T-2 toxin is often permanent, Although T-2 Toxin may be inhaled or ingested, T-2 Toxin mycotoxin is documented to be absorbed directly through the skin and into the blood stream.